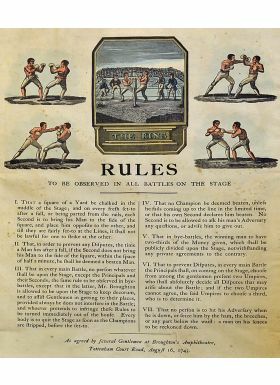 1743 Broughton’s Rules of Boxing Broadside a superbly presented broadside depicting various coloured vignettes of boxing contestants surrounding a central ‘The Ring’ boxing scene. These set above the very first official rules of the sport defined below. Heavyweight Champion Jack Broughton introduced the rules in attempt to reduce the increasing brutality and lawlessness of pugilistic contests, setting rules which codified and eliminated certain practices, such as hitting opponents whilst they are down or seizing opponents by their hair. 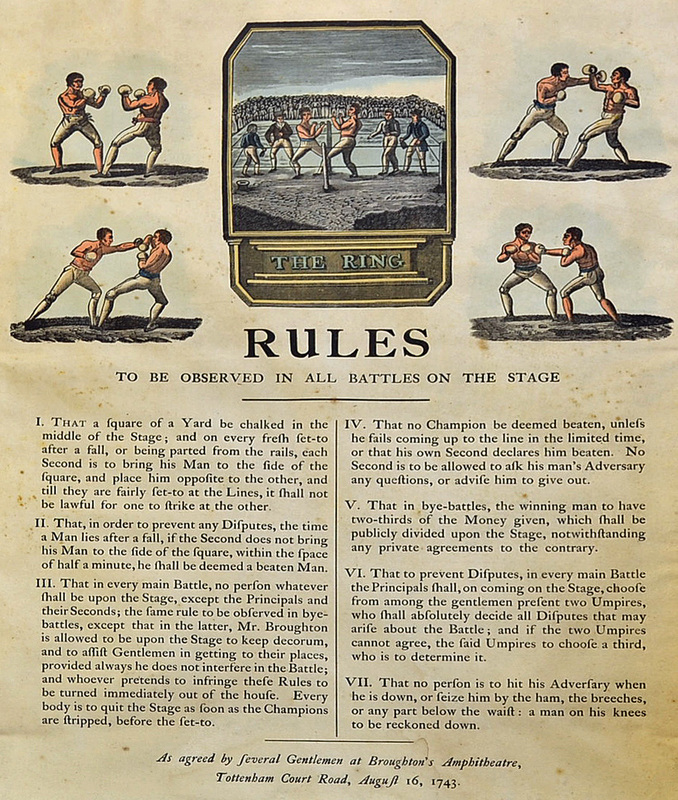 This set of rules governed the sport until 1838. The broadside dated August 16 1743, this set of rules was ‘As agreed by several gentlemen at Broughton’s amphitheatre’, a superb and rare item of boxing memorabilia very scarce to come onto the market, the condition appears to be good, with minor speckled foxing present, the text and vignettes are very clean with small tape marks apparent to the edges in places, framed and glazed, measures 56x68cm approx.